Electronic Media connects the traditional world of broadcasting with the contemporary universe of digital electronic media. It provides a synopsis of the beginnings of electronic media in broadcasting, and the subsequent advancements into digital media. 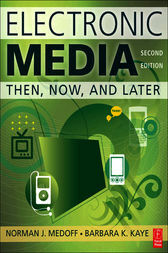 Underlying the structure of the book is a "See It Then, See It Now, See It Later approach that focuses on how past innovations lay the groundwork for changing trends in technology, providing the opportunity and demand for change in both broadcasting and digital media. FYI and Zoom-In boxes point to further information, tying together the immediate and long-ranging issues surrounding electronic media. Career Tracks feature the experiences of industry experts and share tips in how to approach this challenging industry. Check out the companion website at http://www.routledge.com/cw/medoff-9780240812564/ for materials for both students and instructors. Dr. Medoff is Director of the School of Communication at Northern Arizona University. He has taught and served as an administrator at three different universities, produced numerous television and corporate video projects, and has overseen the productions of many students. Dr. Medoff has authored articles in scholarly journals as well as trade and consumer magazines. He has also written textbooks on the Internet and mass media, television production, and electronic media. In addition, he has served as president of the Broadcast Education Association and has recently been the recipient of a Fulbright Specialist Grant.